"Thunder" is a song by American pop rock band Imagine Dragons. It was released by Interscope Records and Kidinakorner on April 27, 2017, as the second single from their third studio album, Evolve (2017). 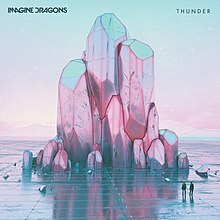 Written by Dan Reynolds, Wayne Sermon, Ben McKee, Daniel Platzman, and its producers Alexander Grant and Jayson DeZuzio, "Thunder" peaked at number four on the US Billboard Hot 100. The song became the band's fourth single in that country to reach the top ten after "Radioactive", "Demons" and "Believer". It also reached the top 10 in Australia, Austria, Belgium, Canada, Germany, Italy, New Zealand, Poland, Slovakia, Slovenia, Sweden, and Switzerland, and the top 20 in Finland, France, Ireland, Lebanon, Mexico, Norway, Portugal, and the United Kingdom. The official music video for the song was released on Imagine Dragons' YouTube channel on May 2, 2017. The video was shot in Dubai, filmed in black and white. It features the band's lead vocalist, Dan Reynolds, singing and dancing among extraterrestrials, portrayed by dancers Haroon Al Abdali, Mamadou Bathily, and Gianna Gi, around a futuristic city. It was directed by Joseph Kahn. As of February 2019, the video has over 1.1 billion views, and is currently the most viewed video on the band's YouTube channel. Imagine Dragons performed the song at the 2017 American Music Awards, in a medley with singer Khalid's "Young Dumb & Broke", with Khalid joining them for the performance. A little over a month later, on December 20, a studio version of the mash-up was released. "Thunder" peaked at number four on the US Billboard Hot 100. The single has also reached number one in Belarus, the Czech Republic and Latvia and the top ten in Australia, Austria, Belgium, Canada, Germany, Hungary, Italy, Netherlands, New Zealand, Paraguay, Poland, Russia, Slovakia, Sweden, and Switzerland. It topped the Billboard Hot Rock Songs (nineteen weeks so far), Alternative Songs (three weeks), Adult Top 40 (seven weeks), and the Mainstream Top 40 (for one week) charts. It became the ninth best-selling song in the United States, with 1,189,000 copies sold in the year. Critics from Billboard magazine placed it number 84 on its list of best songs of 2017. "Thunder" is used in the trailer for the 2018 animated film Teen Titans Go! To the Movies, along with "Watch Me". ^ Harvilla, Rob (June 23, 2017). "It Is Time to Talk About Imagine Dragons". The Ringer. ^ "Imagine Dragons Debut New Song 'Thunder'". CBS Radio. April 27, 2017. Retrieved May 5, 2017. ^ Anieka, Sequeira (May 3, 2017). "Imagine Dragons unveil 'Thunder' video shot here in Dubai". Gulf News. Retrieved May 5, 2017. ^ "Imagine Dragons -Thunder". YouTube. May 2, 2017. ^ Tom, Littrell (May 3, 2017). "WATCH: New Video for Imagine Dragons' 'Thunder'". Hot Press. Retrieved May 5, 2017. ^ Lamarre, Carl (November 19, 2017). "Khalid & Imagine Dragons Team Up for 'Young, Dumb & Broke' & 'Thunder' Performance at 2017 AMAs". Billboard. Retrieved December 25, 2017. ^ a b c "Thunder / Young Dumb & Broke (Medley) – Single by Imagine Dragons & Khalid on Apple Music". iTunes. Retrieved December 25, 2017. ^ a b Trust, Gary (November 20, 2017). "Post Malone's 'Rockstar' Tops Hot 100, Camila Cabello's 'Havana' Is Top Seller & Imagine Dragons Rule Radio". Billboard. Retrieved November 21, 2017. ^ "Imagine Dragons – Chart history (Billboard Hot 100)". Billboard. Retrieved May 27, 2017. ^ Trust, Gary (December 11, 2017). "Ed Sheeran & Beyonce's 'Perfect' Tops Billboard Hot 100". Billboard. ^ "Imagine Dragons' 'Thunder' Rolls to No. 1 on Hot Rock Songs Chart". Billboard. Retrieved November 20, 2017. ^ Trust, Gary (November 20, 2017). "Imagine Dragons' 'Thunder' Hits No. 1 on Pop Songs Chart". Billboard. Retrieved November 21, 2017. ^ a b Caulfield, Keith (January 3, 2018). "Ed Sheeran's 'Divide' Is Nielsen Music's Top Album of 2017 in U.S." Billboard. Retrieved January 15, 2018. ^ "Best Songs of 2017: Billboard's Top 100 Picks". Billboard. December 13, 2017. Retrieved December 29, 2017. ^ "Teen Titans GO! To The Movies - Official Trailer 1 [HD]". YouTube. May 1, 2018. ^ a b "Thunder – Single by Imagine Dragons". iTunes Store (US). Retrieved May 5, 2017. ^ a b "Thunder (Official Remix) – Single by Imagine Dragons on Apple Music". iTunes Store (US). Retrieved September 15, 2017. ^ "Amazon.ca: Thunder: Imagine Dragons: CD Single". Amazon. Retrieved April 27, 2017. ^ "Australian-charts.com – Imagine Dragons – Thunder". ARIA Top 50 Singles. Retrieved July 29, 2017. ^ "Austriancharts.at – Imagine Dragons – Thunder" (in German). Ö3 Austria Top 40. Retrieved July 5, 2017. ^ "Ultratop.be – Imagine Dragons – Thunder" (in Dutch). Ultratop 50. Retrieved September 29, 2017. ^ "Ultratop.be – Imagine Dragons – Thunder" (in French). Ultratop 50. Retrieved September 1, 2017. ^ "Imagine Dragons Chart History (Canadian Hot 100)". Billboard. Retrieved January 9, 2018. ^ Imagine Dragons — Thunder. Tophit. ^ "ČNS IFPI" (in Czech). Hitparáda – Digital Top 100 Oficiální. IFPI Czech Republic. Note: Change the chart to CZ – SINGLES DIGITAL – TOP 100 and insert 201739 into search. Retrieved October 8, 2017. ^ "Imagine Dragons: Thunder" (in Finnish). Musiikkituottajat – IFPI Finland. Retrieved May 28, 2017. ^ "Lescharts.com – Imagine Dragons – Thunder" (in French). Les classement single. Retrieved October 2, 2017. ^ "Offiziellecharts.de – Imagine Dragons – Thunder". GfK Entertainment Charts. Retrieved July 21, 2017. ^ "Archívum – Slágerlisták – MAHASZ" (in Hungarian). Rádiós Top 40 játszási lista. Magyar Hanglemezkiadók Szövetsége. Retrieved July 27, 2017. ^ "Archívum – Slágerlisták – MAHASZ" (in Hungarian). Single (track) Top 40 lista. Magyar Hanglemezkiadók Szövetsége. Retrieved August 31, 2017. ^ "Archívum – Slágerlisták – MAHASZ" (in Hungarian). Stream Top 40 slágerlista. Magyar Hanglemezkiadók Szövetsége. Retrieved July 13, 2017. ^ "The Irish Charts – Search Results – Imagine Dragons". Irish Singles Chart. Retrieved July 22, 2017. ^ "Italiancharts.com – Imagine Dragons – Thunder". Top Digital Download. Retrieved July 1, 2017. ^ "Imagine Dragons Lebanese Chart Top 20 History". The Official Lebanese Top 20. September 11, 2017. Retrieved September 11, 2017. ^ "Mexico Airplay: Sep 23, 2017". Billboard. Retrieved May 16, 2018. (Subscription required (help)). ^ "Nederlandse Top 40 – week 32, 2017" (in Dutch). Dutch Top 40 Retrieved August 11, 2017. ^ "Dutchcharts.nl – Imagine Dragons – Thunder" (in Dutch). Single Top 100. Retrieved September 8, 2017. ^ "Charts.nz – Imagine Dragons – Thunder". Top 40 Singles. Retrieved July 7, 2017. ^ "Norwegiancharts.com – Imagine Dragons – Thunder". VG-lista. Retrieved July 1, 2017. ^ "BillboardPH Hot 100". Billboard Philippines. Retrieved December 18, 2017. ^ "Listy bestsellerów, wyróżnienia :: Związek Producentów Audio-Video". Polish Airplay Top 100. Retrieved October 16, 2017. ^ "Portuguesecharts.com – Imagine Dragons – Thunder". AFP Top 100 Singles. Retrieved July 22, 2017. ^ "Russia Airplay Chart for 2017-09-18." Tophit. 2017-09-18. ^ "ČNS IFPI" (in Slovak). Hitparáda – Radio Top 100 Oficiálna. IFPI Czech Republic. Note: insert 201741 into search. Retrieved October 17, 2017. ^ "ČNS IFPI" (in Slovak). Hitparáda – Singles Digital Top 100 Oficiálna. IFPI Czech Republic. Note: Select SINGLES DIGITAL - TOP 100 and insert 201722 into search. Retrieved June 6, 2017. ^ "SloTop50: Slovenian official singles weekly chart" (in Slovenian). SloTop50. Retrieved October 23, 2017. ^ "Spanishcharts.com – Imagine Dragons – Thunder" Canciones Top 50. Retrieved April 5, 2018. ^ "Swedishcharts.com – Imagine Dragons – Thunder". Singles Top 100. Retrieved June 30, 2017. ^ "Swisscharts.com – Imagine Dragons – Thunder". Swiss Singles Chart. Retrieved July 31, 2017. ^ "Official Singles Chart Top 100". Official Charts Company. Retrieved July 22, 2017. ^ a b "Imagine Dragons Chart History (Hot 100)". Billboard. Retrieved January 1, 2019. ^ "Imagine Dragons Chart History (Adult Contemporary)". Billboard. Retrieved May 1, 2018. ^ "Imagine Dragons Chart History (Adult Pop Songs)". Billboard. Retrieved November 28, 2017. ^ "Imagine Dragons Chart History (Pop Songs)". Billboard. Retrieved November 21, 2017. ^ a b "Imagine Dragons Chart History (Hot Rock Songs)". Billboard. Retrieved January 1, 2019. ^ "Imagine Dragons Chart History (Rock Airplay)". Billboard. Retrieved October 17, 2017. ^ "SloTop50 – Slovenian official Year-End singles chart". SloTop50. Retrieved January 8, 2018. ^ "End of Year Singles Chart Top 100 – 2017". Official Charts Company. Retrieved January 10, 2018. ^ "Hot Rock Songs – Year-End 2017". Billboard. Retrieved January 5, 2019. ^ a b "Hot Rock Songs – Year-End 2018". Billboard. Retrieved January 5, 2019. ^ "Pop Songs – Year-End 2018". Billboard. Retrieved December 5, 2018. ^ "ARIA Chart Watch #492". auspOp. September 29, 2018. Retrieved September 29, 2018. ^ "Austrian single certifications – Imagine Dragons – Thunder" (in German). IFPI Austria. Retrieved December 20, 2017. Enter Imagine Dragons in the field Interpret. Enter Thunder in the field Titel. Select single in the field Format. Click Suchen. ^ "Brazilian single certifications – Imagine Dragons – Thunder" (in Portuguese). Associação Brasileira dos Produtores de Discos. Retrieved September 24, 2018. ^ "Canadian single certifications – Imagine Dragons – Thunder". Music Canada. Retrieved May 3, 2018. ^ "Imagine Dragons "Thunder"". IFPI Denmark. November 28, 2017. Retrieved December 5, 2017. ^ "French single certifications – Imagine Dragons – Thunder" (in French). Syndicat National de l'Édition Phonographique. Retrieved March 1, 2018. ^ "Gold-/Platin-Datenbank (Imagine Dragons; 'Thunder')" (in German). Bundesverband Musikindustrie. Retrieved December 20, 2018. ^ "Italian single certifications – Imagine Dragons – Thunder" (in Italian). Federazione Industria Musicale Italiana. Retrieved February 25, 2019. Select "2019" in the "Anno" drop-down menu. Select "Thunder" in the "Filtra" field. Select "Singoli online" under "Sezione". ^ "New Zealand single certifications – Imagine Dragons – Thunder". Recorded Music NZ. Retrieved November 17, 2017. ^ "Norwegian single certifications – Imagine Dragons – Thunder" (in Norwegian). IFPI Norway. Retrieved July 29, 2018. ^ "Spanish single certifications – Imagine Dragons – Thunder" (PDF) (in Spanish). Productores de Música de España. Retrieved 27 September 2017. Select single under "Chart", enter the certification year in the field "Year". Select the certification week in the field "Semana". Click on "Search Charts". ^ "Guld- och Platinacertifikat" (in Swedish). IFPI Sweden. Retrieved March 9, 2018. Type Imagine Dragons in the top right search bar. Click on "Sok" and select "Visa" under Thunder to see certification. ^ "British single certifications – Imagine Dragons – Thunder". British Phonographic Industry. Retrieved June 1, 2018. Select singles in the Format field. Select Platinum in the Certification field. Type Thunder in the "Search BPI Awards" field and then press Enter. ^ "American single certifications – Imagine Dragons – Thunder". Recording Industry Association of America. Retrieved April 14, 2018. If necessary, click Advanced, then click Format, then select Single, then click SEARCH. ^ "Imagine Dragons - Thunder RadioDate". Radioairplay.fm. May 26, 2017. Retrieved August 29, 2017. ^ "Hot/Modern/AC Future Releases". All Access Music Group. Retrieved September 8, 2017. ^ "Top 40/M Future Releases". All Access Music Group. Retrieved August 29, 2017.